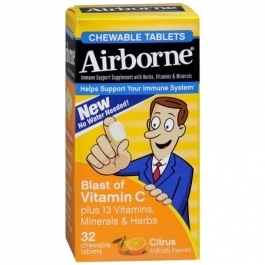 Airborne® Chew Tablets are packed with key vitamins to help support your immune health. Each tablet delivers 1,000 milligrams of Vitamin C and high quantities of other antioxidants. Vitamin C is an antioxidant that goes to work on a cellular level to adjust high levels of stress hormones and enhance the function of immune cells throughout your body. Vitamin E inactivates free radicals that can harm cells. Vitamin A, a phytonutrient that works as an antioxidant, promotes immune health and protects DNA. For adults and children 12 years and older: Chew 4 tablets per serving. Repeat as necessary; up to 12 tablets per day. Store in a cool dry place.